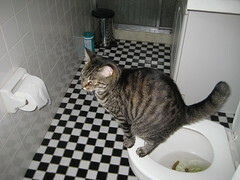 Most of us take toilet training cats for granted: Most kittens seem to learn with very little help from their owners, particularly if you have the mother or another cat in the home to teach them. Even if you don’t, most felines seem to be magnetically drawn to the litter box with very little urging from you. There are however some instances when a kitten won’t take to their litter box and instead may find a houseplant, or worse yet your carpet. Not catching problem behavior quickly might mean your cat will develop a habit of going wherever they please.